Japan is famous for its cultural coherence is inherited from generation to generation by which not much happens in the cultural changes that have taken place. One of the Japanese culture which so far are still inherited are festivals which are held on a regular basis. There are many types of festivals that are held in Japan every year in various regions. Festival of the children is part of many festivals in Japan is very interesting to discuss. Hina Matsuri, also known as Momo no Sekku is a festival held on 3 March, and care for girls. At this time the girls pray for a good marriage. Hina Matsuri festival decoration is negligible-ningyou, namely hina dolls. The Festival also girls can enjoy foods such as sweets and shirozake red and white. 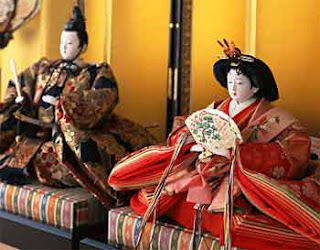 The Japanese believe that it is not good to let the hina dolls long because it is believed that delay the wedding, so as soon as they can be discarded after 3 March. The popularity of Momo no Sekku as Hina Matsuri has existed since the Meiji period, which was previously a field day festival for boys and girls. 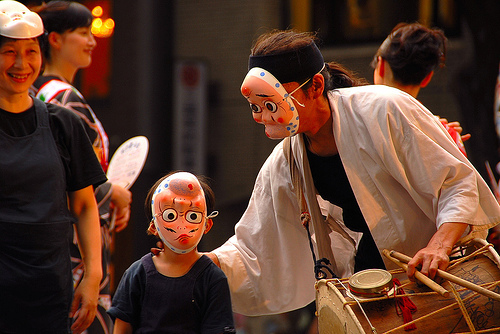 In addition to the Festival for girls, in Japan, there is also a festival for children, Tango no Sekku and Shichi-go-san. Both the festival exclusively for children. Tango no Sekku better known as the day of the child and it is a national holiday on May 5. Every family who has a behaviour of a child gives a samurai dolls and helmets miniature cloak of protection, as well as koi-nobori, who was hanged, and buy iris and Kashiwa mochi, and do not forget to pray for their children by their success in life. Samurai dolls and koi-nobori Yes is already in the Edo period, and became increasingly popular during the Meiji period. Tango no Sekku Furthermore the Shichi-go-san festival is a celebration for children who have reached the third anniversary or fifth and girls that have repeated the third year or the seventh to start dressing and honoring their ancestors.